In an article that appeared in U.S.A. Today, December 10, 2002 titled “Psychologists Now Know What Makes You Happy,” writer Marilyn Elias discovered a not-so surprising fact: “Forgiveness is the trait most strongly linked to happiness.” If forgiveness is tied that strongly to happiness, perhaps some of the ideas we have grown up with need to be thrown away. We tend to associate happiness with education, success, good health, and so forth. Not that those things are unimportant, but forgiveness is the single most important trait that leads to happiness. And when he returned to Capernaum after some days, it was reported that he was at home. And many were gathered together, so that there was no more room, not even at the door. And he was preaching the word to them. And they came, bringing to him a paralytic carried by four men. And when they could not get near him because of the crowd, they removed the roof above him, and when they had made an opening, they let down the bed on which the paralytic lay. And when Jesus saw their faith, he said to the paralytic, “Son, your sins are forgiven.” Now some of the scribes were sitting there, questioning in their hearts, “Why does this man speak like that? He is blaspheming! Who can forgive sins but God alone?” And immediately Jesus, perceiving in his spirit that they thus questioned within themselves, said to them, “Why do you question these things in your hearts? Which is easier, to say to the paralytic, ‘Your sins are forgiven,’ or to say, ‘Rise, take up your bed and walk’? But that you may know that the Son of Man has authority on earth to forgive sins”—he said to the paralytic— “I say to you, rise, pick up your bed, and go home.” And he rose and immediately picked up his bed and went out before them all, so that they were all amazed and glorified God, saying, “We never saw anything like this!”. The house, the one that had a large hole dug in it, was probably Jesus' own house. He had moved to Capernaum from Nazareth; the point of the first two verses is that when Jesus returned from his short preaching trip around the neighbouring villages, he found crowds pressing around the door as though he were a movie star of well-know footballer. 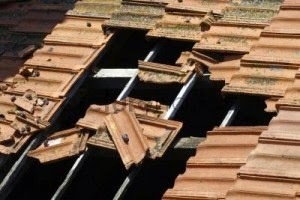 Jesus himself was the unlucky householder who had his roof ruined that day. This opens up quite a new possibility for understanding what Jesus said to the paralysed man How would you feel if someone made a hole in your roof? But Jesus looks down and says, with a rueful smile, "“Son, your sins are forgiven.” At that point, everybody went quiet. Something in the way he sad it made them realise that this forgiveness went deep than mere domestic disputes. Jesus was speaking with an authority that went down to the paralysed mans inner being. The religious types were there and began to debate the matter. They grumbled, cleared their throats and said, “This is blasphemy. Who can forgive sins but God?” The answer is only God can forgive sins and only priests could declare that forgiveness. "If that's what the man needed, his friends should take him to the Temple in Jerusalem, not to some wandering preacher," they might say. What is the relationship among sin, sickness, and forgiveness? Forgiveness from God, removes sin and allows healing from sickness.